I’ve back the Kickstarter for the Tactile Turn Gist way back in October 2015. I got two polycarbonate bodies, one with a zirconium finial and grip with a titanium EF nib, another with bronze finial and grip with a stainless steel 1.1mm nib. I received both pens June 2016. For a manufacturing Kickstarter project I thought the timeline was rather reasonable. I remember being very confused and unable to choose due to the sheer number of combinations that was available on the Kickstarter. I finally decided on zirconium because it was not a material that I’ve heard of. Pairing it with a titanium nib feels like a no brainer to make it the ultimate stealth pen. Whereas the bronze version I got pretty much on a whim, it was one of the cheapest combination with a metal grip. The Tactile Turn Gist came with a very compact box but it protected the pen well. Slide the inner tray out by pulling on the fabric tab and you will find the pen resting in a foam cut out. I really appreciate the effort for designing a small foot print for the packaging. Storing the box isn’t going to be a huge hassle. The Tactile Turn Gist is made of a polycarbonate material also known as Makrolon. 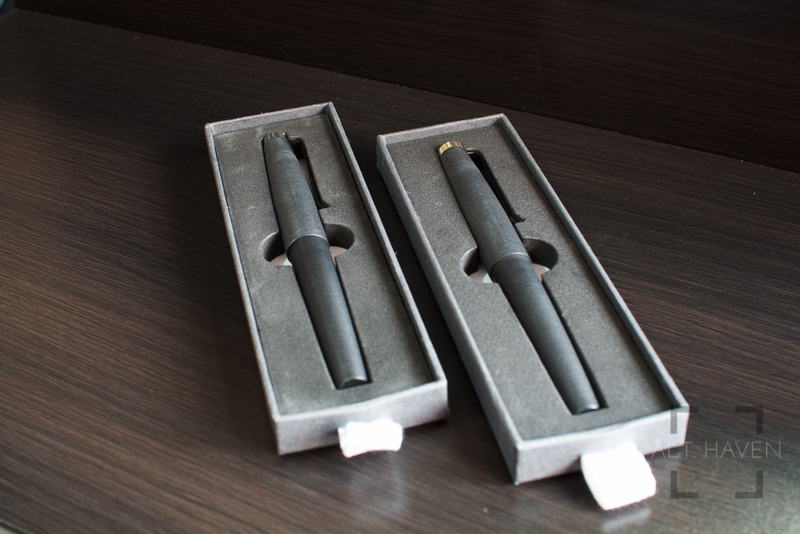 It is the same material that the regular Lamy 2000 is made of. I do not know of any other pen is made of the same material other than the Lamy 2000. I’m not sure if the Gist was made in homage of the Lamy 2000 but it feels like it is inspired by it. The Gist with a polycarbonate body isn’t a heavy pen despite having metal grips. I’m glad I had opted for metal grips. Without them I think the pen might turn out to be too light, making it hard to control. With the metal grips, it helps me to tilt the weight slightly towards the front with the bronze being the slightly heavier one between the two. Though I say the pen is slightly front heavy, it is really very slight. The Tactile Turn Gist isn’t a large pen. It isn’t short enough to be called a pocket pen but it is not quite the same height as other regular sized pens. It is most comparable to my Sailor Professional Gear fountain pen capped or uncapped. Of course, this is easily solved by posting the cap. However not everyone prefers to post their pens so if you have large hands and do not like to post your caps do keep that in mind. The Gist comes standard with a regular metal clip with a upturned lip at the end. It also comes with the option of having the logo engraved on the finial or not during the Kickstarter. I found my pens have varying tension on their clips. The zirconium’s clip is so stiff that it is nigh impossible to lift with my finger. Pulling the clip over fabric to secure it in my pen roll takes quite an effort. However the bronze’s clip was slightly easier to lift and thus more useable though not by much. It takes 2 full revolutions of the cap to uncap the Gist. When I first got the pens, there was this weird tactile sensation whenever I cap and uncap the pens. It feels strangely like cardboard rubbing against cardboard when I cap and uncap the pens. Maybe the threads on the inner cap isn’t as polished as it can be? I am not really sure what made it feel that way. It’s not a complain but it was a sensation that really stood out to me when I first used it. After using it for months, the sensation is gone. Maybe I’ve got used to it, maybe I’ve polished the threads just by using it? The Gist has a generously long grip section. Together with next to nothing of a step between the barrel and the grip, it makes for a very comfortable hold on the pen for me. Not forgetting the ridges on the grip section, I have no problems holding and controlling the pen as I see fit. The Gist is a standard international cartridge converter fountain pen but a regular standard international converter doesn’t fit due to the length of the barrel. A Faber-Castell converter I had lying around didn’t fit the Gist because it was too long. Comparing the length of a standard international long cartridge with the Gist’s provided converter, the cartridge is a little longer than the converter. Basically, you are stuck with using Tactile Turn’s provided converter or short international cartridges. It’s a bit of a bummer that it is like that. Though I really like the form factor of the Gist, maybe it would be more prudent to lengthen the barrel to fit a regular standard international converter? The Gist comes with a standard #6 size Bock nib. Bock is a trusted and well known nib supplier. A #6 nib size on the Gist’s smaller pen body is really generous and makes for a very decent pairing between the pen and nib. An additional plus point of using Bock nibs, you can buy nibs directly from Tactile Turn and swap them out. I had went with a titanium nib and a 1.1mm stub stainless steel nib. This was my first experience with a titanium nib. Titanium nibs tend to be soft, similar to some gold nibs but it sings as you write in a different way from feedback. Plus a titanium nib is slightly more prone to being over flexed and their tines not snapping back correctly. In a way, it is more fragile than a gold nib. I find myself being very gentle with my titanium nib. It hums and buzzes as I write with it. Though I had went with an EF nib it still writes relatively wet. It is not a completely smooth writer but I really enjoy the different resonance that writing with a titanium nib provides. On the other hand, the stainless steel 1.1mm stub nib is not tipped and it has a little feedback as I use it. It can be scratchy and have horrible ink flow if you don’t hold it at the correct angle but that’s just the nature of a stub nib. 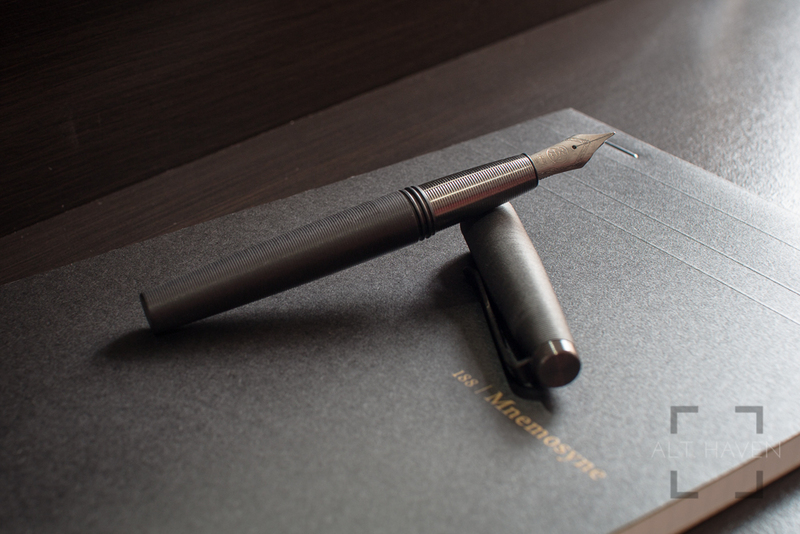 The Tactile Turn Gist is an interesting fountain pen with a very nice grippy section. The combinations and nib choices that Tactile Turn provides is just bedazzling. Personally I wouldn’t want to keep both pens around. I hadn’t quite decided which pen or nib I want to hang onto. I am currently leaning towards the zirconium with the Titanium nib.